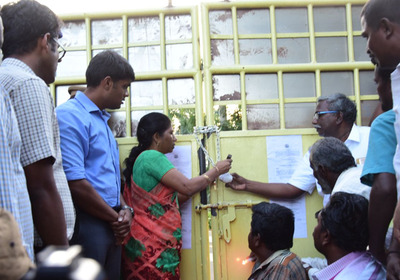 Tuticorin district collector seals the Sterlite copper plant TUTICORIN: The Tamil Nadu government on Monday issued a Government Order, directing the state Pollution Control Board to seal the Vedanta group's copper pla nt and close it down "permanently" following last week's violent protests during which 13 people were killed in police firing. "Under sections, 18 (1) (b) of the Water Act, 1974, in the larger public interest, the govern ment endorses the closure direction of the TNPCB to seal the unit and close the plant permanently," the state government said in its order issued by environment secretary M D Nasimuddin. Get latest news & live updates on the go on your pc with New s App. Download The Times of India news app for your device. Read more India news in English and other languages.